Catoonah Street today is a microcosm of Ridgefield, with everything from stores and offices to condos and large, single-family homes, not to mention a church, a post office, a cleaners, a restaurant, and a firehouse. But it once also had a shirt factory. Yes, Ridgefield in the 19th Century was a center, albeit small, of the shirt-making industry, thanks to a man named D. Smith Sholes and his partner, Edward H. Smith, both leading citizens of the town. David Smith Sholes was born in Ridgefield in 1830, son of a shoemaker who’d moved here from Vermont. He attended local schools including a private school taught by the Rev. David H. Short on Main Street, where Sholes acquired a love of reading. He later helped found a circulating library in Ridgefield that grew into today’s Ridgefield Library, of which he was once treasurer. When he was 15, he became a clerk at Henry Smith’s store on Main Street but after a few years went to Bridgeport to learn bookkeeping. He returned to Ridgefield and, in partnership with Smith, operated the Ridgefield Shirt Factory, which had been founded in the 1840s by George Hunt. The factory was at first located in the Big Shop, a large building that stood where the First Congregational Church is now. (Moved around 1888 to the center of town, the Big Shop is now the home of Terra Sole and Luc’s restaurants, and other businesses off the Bailey Avenue parking lot.) The shirt factory later moved across the street to a building on what’s now an empty lot, and then to Catoonah Street on the site of the current Ridgefield Fire Department headquarters. However, it appears many more Ridgefield Shirt “employees,” mostly women but including a few men, worked from their homes. Sholes and Smith would provide them with packages of shirt “components” and the women would sew them together in their spare time. The final product was prepared for sale and packaged at the factory. The New York Times reported in 1860 that there were 1,100 home-working women in the area, sewing for Ridgefield Shirt. Sholes continued in the shirt-making business until around 1893 when, probably faced with competition from large-scale, mechanized clothing operations in New York City, the factory was closed. In 1886 Sholes was elected treasurer of the Ridgefield Savings Bank, now Fairfield County Bank; he had been one of its incorporators when it was founded back in 1871. He eventually became the bank’s president. This profuse praise appeared in a newspaper whose company president was D. Smith Sholes. Possible pro-Sholes press prejudice aside, the man was clearly a respected and popular personality in town. 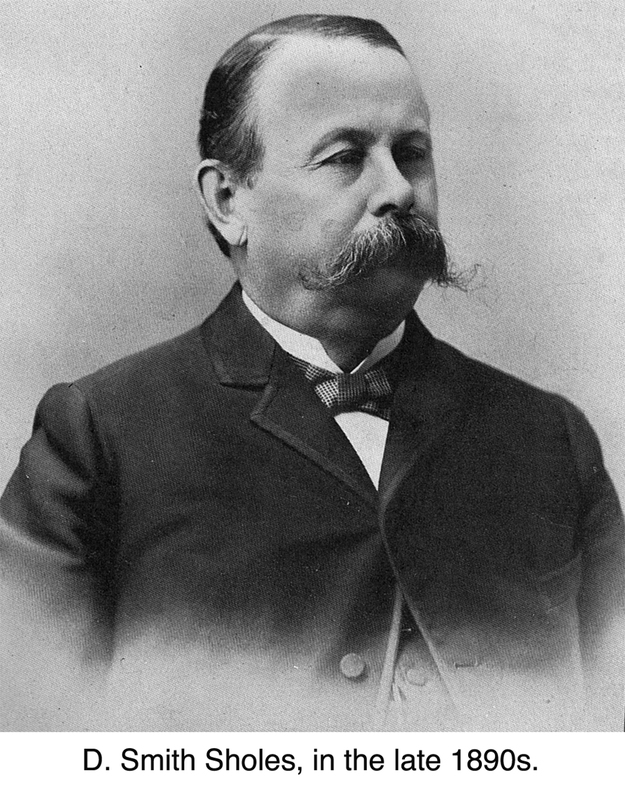 An active Democrat, he was appointed Ridgefield’s postmaster in 1886 by President Grover Cleveland, also a Democrat. When Cleveland left office, so did Sholes, but when Cleveland returned for a second term, so did Sholes. He was a town assessor, a registrar of voters for 17 years, the probate judge in 1870, a member of the Democratic State Central Committee for two terms, treasurer of the Ridgefield Water Supply Company, and a clerk of St. Stephen’s Church for a quarter of a century. He also helped found the First National Bank of Ridgefield in 1900 and was its first cashier.